Whoa. Those are heavy, heavy words. What do you think? Is Krauthammer a drama queen for bringing up the Holocaust? Or has the way the international community treats Israel gotten so insane, that the only way to make sense of the situation is to compare it to last century's organized attempt to wipe out the Jewish people? Personally, I don't think Krauthammer is being hysterical here. In college, I double majored in Political Science and German, and most of my coursework focused on twentieth century political, social, and economic developments in the United States and Western Europe. It is one thing to read a textbook about the Holocaust, it is something entirely different to hear and comprehend Adolf Hitler's speeches in the original German. The German language is especially well-structured for powerful symbolism, which can create works of art that lift the soul and enlighten the mind, like the poems of Johann Wolfgang von Goethe, or it can be used as an instrument to deliver purely malevolent evil, as Hitler and the Nazis did. People on both sides of the aisle have been far too willing to compare their political opponents to the Nationalsozialisten. George Bush is not Adolf Hitler, and President Obama is not a Nazi. By cheapening the rhetoric, and tossing around the "Nazi" insult without respect for its true meaning, the overwhelming tragic losses of the Holocaust are also cheapened and minimized. When Israel's defense of its borders and its people are misrepresented as aggression, and terrorists portrayed as victims, it is a betrayal of civilization and a deliberate ignorance of history. The economic and political climate in the world today causes me great worry. There's no time period in history that is exactly like one that came before, but there are certain warning signs and potential trigger points for tragedy that are unwise to ignore. Remember, Adolf Hitler did not immediately demand the extinction of millions of innocent people when he first began his climb to power. "Reforms" were passed little by little, step by step, and justified by the hated Versailles Treaty, the economic depression, and the Nazis' distasteful message of the inferiority of all non-Aryan people. Visiting a concentration camp is not like visiting any other historical site. Nothing really prepares you to gaze into a brick oven where human beings were burned, or to walk through a "shower" room where the faucets poured poison gas instead of water. For me, one of the most brutal and tragic aspects of Dachau was not within the walls, but just outside it: a residential neighborhood. To fully understand the horror of this, I ask you to think about your hometown, where you grew up. Picture where the grocery store was located, where you played Little League Baseball, what street your elementary school was on. Imagine walking down whatever is "Main Street" in your town, turning down a side street to your favorite coffee shop, and at the end of the block you see a walled-in camp with giant plumes of sickly-sweet smelling smoke that burns without relief. I had previously assumed that the concentration camps were like many military bases, built in remote areas, or at least with a large buffer zone between the camp and adjacent development. This is not the case in Dachau. You walk down a street, and ARBEIT MACHT FREI is right before your eyes, and you can easily see into the grounds of the camp. Any Dachau resident walking by would have easily been able to observe the smoke from the ovens and cries of pain from the people imprisoned there. 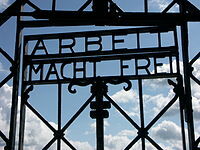 I cannot believe that the people of Dachau did not know what was happening at that camp. So what does this have to do with Israel and the Gaza flotilla today? Simply, that those of us who value our humanity, our souls, and our civilization cannot just ignore what is happening right before our eyes. The citizens of Dachau each made the choice to walk down the streets of their town and do nothing about the horror next door while the years passed and the body count rose above the ability of anyone to count. Today, America should be a leader in refusing to deny history, refusing to deny the existence of acts of terrorism, and refusing to allow Israel's enemies to continue to try to destroy her people. Your description of the horror of Dachau being so close to the downtown is very poignant. 2) Please help me to promote this book; share this URL with all who might be interested. Thank you in advance. Amazing post! I never knew that Dachau concentration camp was right in the middle of a town. This is something that should be known. Thanks so much for the wonderful article. I agree 100% with what you say here. We must all stand up for what is right and help to cut through the fog and obfuscation of the Israel-Arab conflict. So many of our countrymen and women are truly ignorant of the history of this conflict, the roots of Muslim jew-hatred in the Quran, and the basic facts of the last 60 years in the region. History is so powerful and the truth can be so obscured when one is ignorant of History. Also, Professor Kowalski, I will look forward to checking out your online book. Thanks for the links! The current situation and pre-holocaust days association is obvious. The funny thing is one of our expectations was that having our own state will make as normal regarding our position in the world and the way we mutualy relate. I believe we have the right of self defence with no connection of the holocaust, but it's impossible not to connect. If you think about those days, there was also intelectuals and public indifference for Checoslovakia and Poland fate, which was less horroress but what horror degree do you need? Not to mention Ruanda, Cambodia, Soviet gulags etc, which means that been normal wouldnt help. But There is difference. We are not talking about just indifference but really participation with pervert antisemitic joy, which by itself is a sin and soul corruption. But now that it came, even though I did'nt expected, it's not such a surprise. On the other side, people like Glenn, Hannity, Prof Hanson and a lot of others whom not just are giving their opinion but really raising their voise, I don't take them for granted and may say that I'm a little surprised for their attitude and even their interest on the issue. Voices like that did'nt exist on those days, and (almost) don't exist in Europe these days. BTW I came to this webpage from your comment at Roger L Simon article, which I include to the former names I mentioned, and also people like you and general public as those that send their comments. Also, Professor Kowalski I think you should give more specific description of your book's content when you are trying to promote it. What happened to the Jewish people is terrible. I've been to Dachau, I lived in Israel for 15 years. (I'm O'hern's friend, he sent me to your site for something else and I couldn't help but read this) It is impossible to separate a people from their history, even though some may try, and it is absolutely vital that we learn from it. It is as important that we learn from what is happening right in front of our eyes. The in-humanity that is the treatment of the people of Gaza is unforgivable. Yes some of them shoot rockets and in the last 10 years 29 people have been killed in Israel from these rockets. That's 29 too many people and its unacceptable but there have been 1,500 people killed in Gaza in the last three years in response to these rockets. The border is shut and the people good people have their lives rocked daily at the whim of the Israeli army in defense of their country. Sorry for what happened to the Jews, its wasn't that long ago and its still shocking but what is happening to the Arabs in Gaza is inexcusable. There are 1 million people locked in the Gaza Strip, Israel controls all the borders and the sea, all million of them aren't bad, they aren't all shooting rockets, but they're all punished, they're all dehumanized over and over by the action of the Israeli government, which the Israeli supreme court has had to reel in several times in recent years for their attempts to take even more rights from the Arabs inside Israel. Israel shouldn't get a free pass to lock people up in a ghetto called Gaza for their security and kill as many as they see fit, for their security, just because of the bad things that happened to them. You know what's sad, today, in 2011. There are people, in towns on the other side of the 10 foot high electric fence, and they SEE it happening, they see basic food and basic rights being taken away. They see people being humiliated and de-humanized and they don't do anything. I'm not comparing Israel to Nazi Germany in this because they have a right to be mad on the Israel side of the fence. I am comparing it to your story and I want everyone to see how shocking and easy it is to take someone's humanity even today, with all our information.